Your trusty pocket knife – a wise man or woman like yourself never leaves home without it. But what do you do during your morning jog, afternoon swim or other times you likely have no pockets? 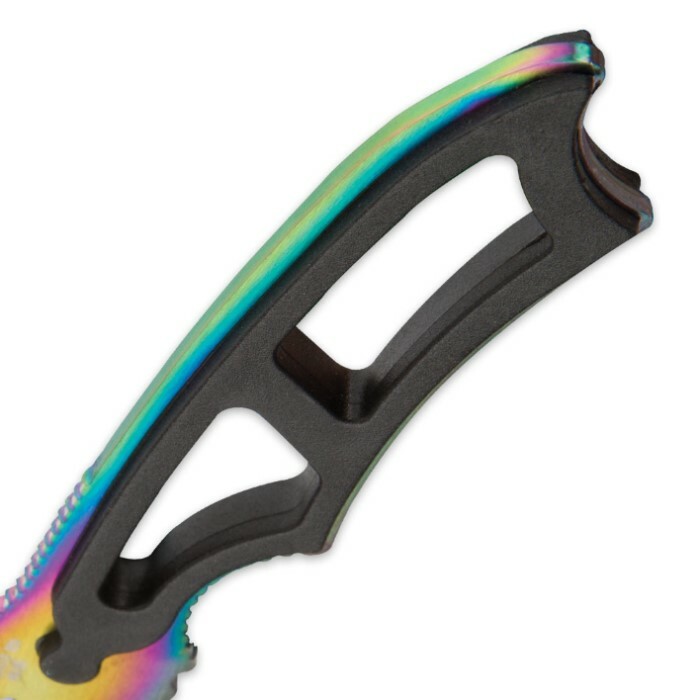 Thanks to the Black Legion Tactical Neck Knife, you never have to venture out vulnerable and unprepared, even when wearing pocket-less athletic wear, swim trunks or pajamas. This handy little fixed-blade terror hangs conveniently from your neck via a durable black nylon cord attached to a molded ABS sheath. The full-tang, razor-sharp 3” 3Cr13 stainless steel tanto blade snaps securely into the sheath, leaving its ergonomic ABS handle exposed and at-the-ready. Though plenty potent solo, paired with a pocket knife, boot knife and/or belt knife, this hanging knife-and-sheath ensemble provides an extra layer of protection, should you find yourself unable to reach into your pocket, boot or belt sheath in the heat of battle. The handle’s open skeletal frame affords optimum balance and weight, so it wears comfortably without chafing or restricting movement. 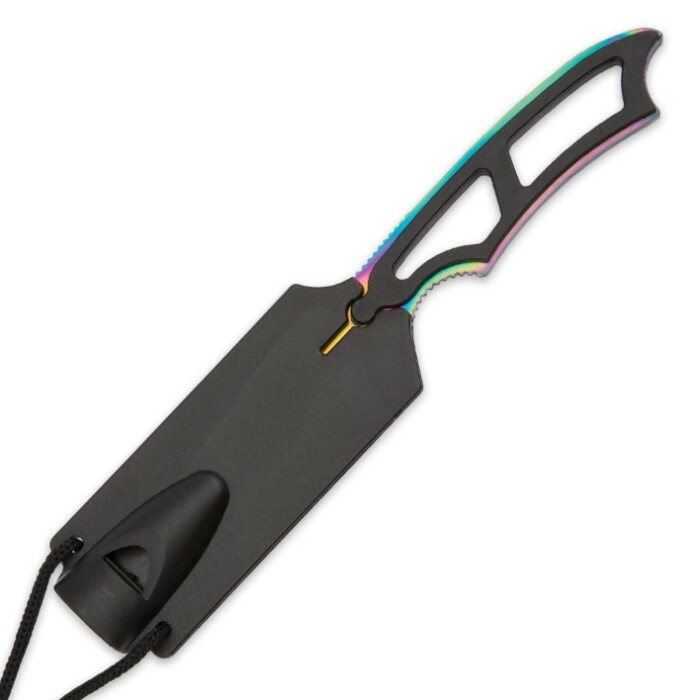 Finished in dazzling iridescent rainbow titanium, this masterfully crafted and designed knife is as much a beauty as it is a beast. 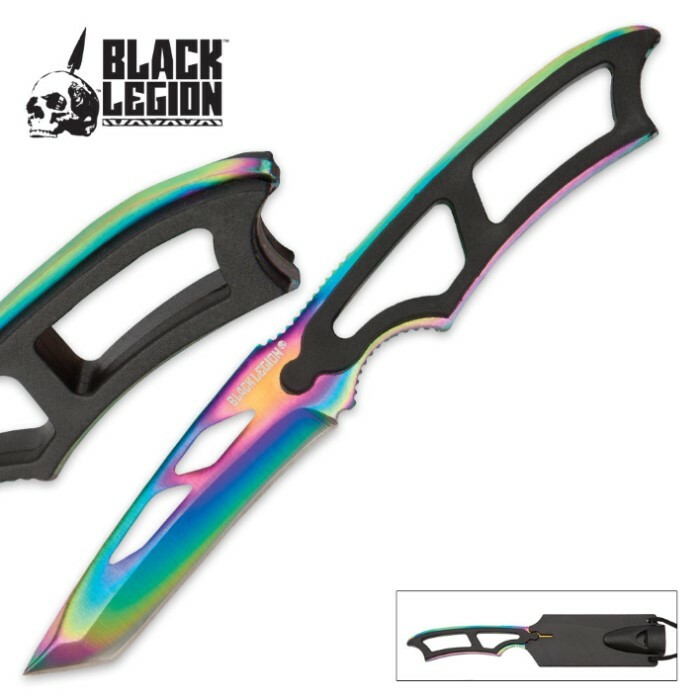 The sheath doubles as an ear-piercing distress whistle that – along with its menacing blade and ease-of-access - makes the Black Legion Tactical Neck Knife an ideal, versatile self-defense tool. It’s a must-have for solo walkers and joggers, or anyone who may one day face a physical threat or danger – this means you! Give one to every family member and other loved ones; at this low price it’s not only thoughtful and smart, it’s painless!